Dr. Mark Frampton is Professor Emeritus of Medicine in Pulmonary and Critical Care at the University of Rochester Medical Center. He received his MD from New York University School of Medicine and then trained in Internal Medicine at Buffalo General Hospital. After nine years of private practice in Williamson, New York, he completed Pulmonary and Critical Care training at the University of Rochester, and then joined the faculty. His research focuses on the human health effects of air pollution. His studies use both environmental chamber and mouthpiece exposure systems to examine the effects of particle and gaseous pollutant exposure on lung function, airway inflammation, and cardiovascular function. Inhalation of the gaseous pollutant, ozone, has been linked with cardiovascular effects. Dr. Frampton directed the University of Rochester Medical Center's participation in the first multi-center clinical study of ozone exposure, Multicenter Ozone Exposure study in oldEr Subjects (MOSES), funded by the Health Effects Institute. Data from these human clinical studies of exposure to air pollutants help to elucidate the mechanisms responsible for pollutant health effects, and assist in establishing rational air quality standards. 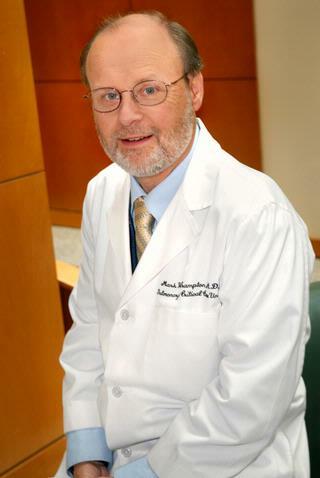 Dr. Frampton directed the NIH-funded training program in pulmonary research at the Medical Center for several years. He is former director the Pulmonary Function Laboratory at Strong Memorial Hospital, and previously served as the Associate Director of the Clinical Research Center at the University of Rochester. Dr. Frampton continues to see outpatients with pulmonary disease, and to teach Pulmonary and Critical Care trainees. He has a special interest in tuberculosis, having directed the Wayne County Tuberculosis Clinic for more than 30 years, and has been caring for patients with tuberculosis infection and disease at the Monroe County Health Department for more than 25 years. Each day the average person breathes about 15,000 liters, or approximately 35 pounds, of air. Gaseous and particulate contaminants in that air gain access to the body with each breath, and may have both short and long-term effects on human health. Our ongoing studies examine the effects of particle exposure on lung function, airway inflammation, and cardiovascular function. Utilizing both environmental chamber and mouthpiece exposure systems, subjects are exposed to environmentally relevant concentrations of pollutants, with or without exercise. Respiratory and systemic effects are determined using measures of lung function, examination for markers of inflammation in exhaled air, characterization of blood leukocyte and platelet responses using 3-color flow cytometry, and detailed cardiovascular monitoring. Ultrafine particles (UFP, <100 nm diameter) may be particularly important with regard to cardiovascular effects because of their potential for evading clearance mechanisms and entering the lung interstitium and vascular space. We have demonstrated in healthy nonsmokers that inhalation of low concentrations of UFP causes changes in leukocyte expression of adhesion molecules, and reductions in the pulmonary diffusing capacity, that are consistent with altered endothelial function. The elderly and people with underlying vascular disease, such as diabetics, may be more susceptible to vascular effects of particle exposure because of impaired endothelial function and increased risk for atherosclerosis. Our studies explore the hypothesis that inhalation of ultrafine particles alters endothelial function in healthy and susceptible people. Endothelial dysfunction is critically linked to the pathogenesis of atherosclerotic vascular disease. Data from these human clinical studies of exposure to air pollutants help to elucidate the mechanisms responsible for pollutant health effects, and assist in establishing rational air quality standards. Rich DQ, Balmes JR, Frampton MW, Zareba W, Stark P, Arjomandi M, Hazucha MJ, Costantini MG, Ganz P, Hollenbeck-Pringle D, Dagincourt N, Bromberg PA. "Cardiovascular function and ozone exposure: The Multicenter Ozone Study in oldEr Subjects (MOSES)." Environment international.. 2018 Oct 0; 119:193-202. Epub 2018 Jul 04. Mock DJ, Frampton MW, Nichols JE, Domurat FM, Signs DJ, Roberts NJ. "Influenza Virus Infection of Human Lymphocytes Occurs in the Immune Cell Cluster of the Developing Antiviral Response." Viruses.. 2018 Aug 10; 10(8)Epub 2018 Aug 10. Arjomandi M, Balmes JR, Frampton MW, Bromberg P, Stark P, Alexis NE, Rich DQ, Costantini M, Hollenbeck-Pringle D, Dagincourt N, Hazucha MJ. "Respiratory Responses to Ozone Exposure. MOSES (The Multicenter Ozone Study in Older Subjects)." American journal of respiratory and critical care medicine.. 2018 May 15; 197(10):1319-1327. Chapter Title: "Human exposure studies"
Author List: Langrish, JP; Frampton, MW; Blomberg, A. Author List: Frampton MW, Roberts NJ Jr.